April 14 | 2019. Narrowboating by the Numbers. | Peter M. Schloss | J.D. - Mediator. Last year, shortly after we booked our reservation for Salten-Fjord, I purchased copies of J.M. Pearson & Son Ltd.’s “Canal Companion”s covering the routes that we intended to travel. Little did I know how valuable these compact guides would be. I had imagined that a canal was like a railroad, just travel where the tracks (or water) carry you. I couldn’t have been more wrong. Good fortune and unexpected insights have been found every day in these guides. Turn the page and there is charming narrative, such as, “The canal crosses the old Roman Road of Watling Street on a study yet elegant aqueduct o iron, brick, and stone construction”… or “Wrenbury Hall’s history goes back to Domesday but the present mock Elizabethan mansion dates from 1919. In living memory it has been used to rehabilitate tuberculosis sufferers…”. Encouraged by these slices of local color we have moored for the express purpose of “smelling the roses”. More practical are the detailed maps that dissect the canals into discreet sections that take 2-4 hours to travel. Each diagram includes a dizzying array of symbols that apprise one of everything from navigational challenges to farms where fresh eggs and home-made ice cream may be purchased. There are precious few signs on the canals. However, every bridge (and there are literally hundreds of them) bears a number on each side. It is these numbers that keep one oriented to where you are, and where you are going. With the exception of the more daunting, locks are often nameless and numberless. Again, they are anticipated by reference to the nearest bridge number. The Pearson Guides also advise as to the quality of the adjoining towpaths and whether they are suitable for man, beast, or bicycle. It is not uncommon for a crew member to hop off and walk the path, often faster than the vessel, in order to reconnoiter, get some exercise, or just secure some quiet personal time. The guides are not perfect. One still must expect the unexpected such as a raised draw bridge that appeared to have become our responsibility to lower. Christine was deposited on shore and I proceeded at the helm to the other side where I believed that she would meet us after lowering and crossing the bridge. 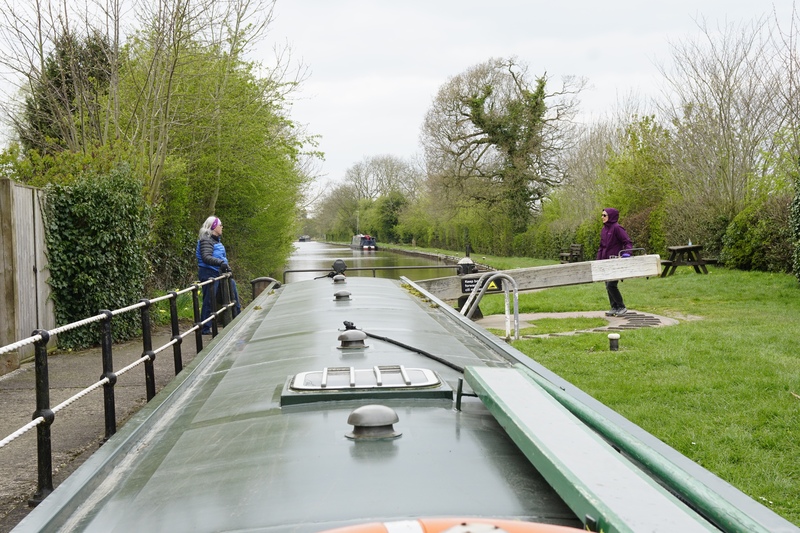 Unfortunately, the bridge was padlocked in the up position and since narrowboats are crap at backing up against a strong wind we (and she) feared that she was marooned on the side of the canal where there was nothing but mud and shoal-water. 15 minutes of effort seasoned liberally with a sailor’s vocabulary finally brought my “Bonny” back to me. Another unexpected surprise suddenly appeared around a blind bend in the canal. 20+ children came darting toward us in miniature kayaks. Like so many little ducklings they darted helter-skelter across the canal in front of us. An adult leader in a canoe shouted to us, “Pay no mind, just go around them!” Apparently she believed that my 30,000 pound 61 foot long vessel was amphibious and just as maneuverable as her canoe. Incredible! Our morning again broke to near freezing temperatures. Winds were light for the first 2 hours which made for good cruising. However the winds piped up to over 20 mph which made the afternoon hours very challenging. By 5 p.m. I was again ready for a proper mooring and a short walk along the canal to a pub, pint, and grub. Tonight it was the “Horse and Jockey”. This has become our routine but the enjoyment at the end of the day on the canal remains anything but routine. PS: Cell coverage has been very spotty along the circuitous and mostly rural canals we have traveled. Tonight I am playing “catch-up” with my posts as the cell signal at this mooring is fairly strong. It has also allowed me to check email, the weather, and of course social media. I also learned that our three days of cruising have placed us only 19 miles from our starting point (as the crow flies). If you have any ambition to canal boating then abandon all hope of getting from point A to point B in a hurry. ← April 13, 2019. Fear at less than 4 mph. I did not realize YOU were the captain. They just turn this 30,000 lb thing over to a novice. Wow. It all sounds amazing. Yes, remarkable trust (and my credit card number). Looks lovely, as they might say in your part of the world. Yes Tom, “lovely” is the local word of approval! Pete, I’m waiting for you to start sharing the fun part of this adventure. Your descriptions of white knuckles, tension headaches and loss of dignity are discouraging! But the views are lovely. Hi Melissa! It is good to hear from you. I hope that I am not over selling the difficulties, because this is actually quite a stunning experience. Certainly there is much adventure and challenge but worth it. Fresh eggs, homemade ice cream … and pot pies perhaps! The meat pies are amazing and my favorite! This particular “episode” reminds me of Camino days. Your Pearson guide, the equivalent of Brierley, the paths and stopping points, the people met along the way and, of course, the simple but delicious meals. Enjoying this particular journey. Yes Karin, we have made the same connections and comments. Today we met a couple from England and shared dinner with them at a local restaurant. They had both walked the Camino.